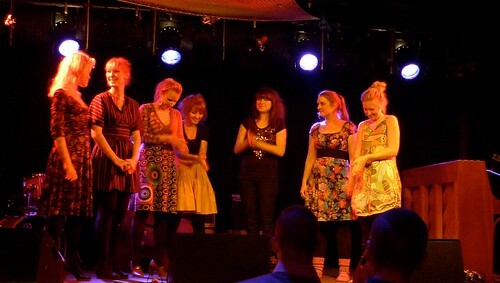 IKI ended 2010 with two concerts, some sickness and a great Christmas party. Both at our concert at På Jam in Malmø the 15/12 and at the Musketer Festival 17/12 we were only six people due to illness, which turned out to be a fun and interesting challenge for us. Both concerts were packed with great audiences that made the music go into new shapes that we hadn’t anticipated ourselves. We were also very lucky and got some great musicians and singers to join us. At our På Jam gig Linnea Henriksson joined us for a piece and at the Musketer Festival we did our first concert with instrumentalists! Kristian Tangvik (tuba), Mette Henriette Martedatter Rølvåg (sax) and Disa Jakobs (vocal) made our 15 minutes to some of the most memorable IKI minutes we’ve ever had. We’re all looking forward to 2011 and we know that it will be an amazing year! Check out pictures from our Malmø gig in our gallery. Video and pics from IKI DADA performance! In November we did a Flash Mob Performance together with a group of ten dancers. Enjoy the footage! IKI dances in the first half and sings in the second half of the video. Just as we were beginning to wonder how on earth we were going to find money to finish our record, a snail-mail letter from Danish Actors’ Association appeared in my mailbox, telling me that IKI was granted for our project CD release!!! We’re so happy and we can’t wait to make this CD sound and look absolutely amazing! By the way! There are just two concerts left this year: Dec. 15th in Malmö and Dec. 17th in Copenhagen – check out Concerts & Tours for more info.